help you with suggestions regarding colours and sizes, fabrics and styles. shoulder to shoulder tape to retain shape. WRAP certified. Ethical & Sweatshop free. Teal, White, Cyan and Platinum (above). Notice Ladies Y-Neckline and Turn Back Cuff. Effortless Dressing, Cool and Comfortable. Matte jersey with a soft draped neckline. Features an elegant gatherered front. Charcoal, Jade, Cobalt, White, Dark Lilac. Purple Stripe, Soft Melon Stripe. can be coordinated with a Jacket. Slightly longer body length and sleeve styling. 60% Viscose, 35% Nylon, 5% Elastane. Dusty Pink and also Plain Black and Ivory. A light fabric with the feel of silk. Large Size range of 4 to 26.
in these slim stripe shirts. Available in Blue, Red, Lime and Violet. Womens Sizes 6-24. Mens 38 to 50cm. Compare Our Price at $29.00 (20 pcs) ex GST. moves easily with you, smart appearance. Midnight Blue, Silver Mist, Blush Pink, Ivory. pleat, and functional easy care fabric. 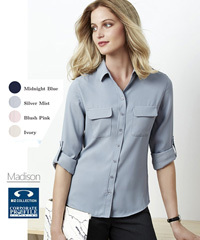 Madison has large range of Sizes 6-26.
roll up the sleeves and wear loosely out. Hospitality, Clubs, Healthcare and Beauty. Womens Short Sleeve and 3/4 Sleeve options. Wash, Fast Drying and Wear. From $36.58 (20 pcs) ex GST. Madison sleeveless top, easy elegance. front. Coordinates with Madison range. Notice the dressy little pocket. French Navy, Cardinal Red, Purple Reign. allow space for a company logo or badge. Try It On! Request A Sample To Inspect. Best quality 100% Cotton Check shirt. Stripe and Plain Cotton Shirts. Sizes SM-3XL. Blue, Black, Light Blue. Trendy Oxford White and Blue Shirts. Superior Organic Cotton, fancy buttons. the Neckline and Cuffs. Tailored Style! Easy to iron, shrink resistant and durable. White, Blue, Green, Silver. Ladies and Mens. The new range of Boulevard shirts. A collection of coordinated shirts and accessories. Melon, and Alaskan Blue (light). 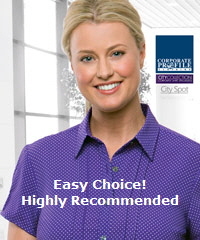 polyester shirt in plain , solid colours. Melon, White and Alaskan Blue (Light Blue). A collection of coordinated shirts. Delightful appearance and easy to wear. embroidered with your Company or Club logo. Some colours are currently low in stock. Flattering womens top with longer length. logo, classic fit, warm machine wash.
Colours, Black, White, Red, Royal. Silk Like Texture. Petite pleats on Sleeve. Black, Blush, Melon, Mint, Navy. Short Sleeve and Long Sleeve. on the front and shoulder. without a tie, tucked or untucked. Graphite Stripe and Cherry Stripe. Enjoy wearing your own Brand Colours. high performance Climate Smart colours. Low Minimum Order 100 pcs. 6 Weeks Delivery. Design and Art Service. Smart black pants available in three body fits. fit and flatter. Professional and comfortable. Machine washable and no ironing. Loads of features and great package deals. 3% Elastane. Stretch lining for comfort. Sits comfortably with Band around the waist. when seated or standing. Machine washable. Lovely fabric quality and colours. Round neck top with front pleats. Pepper Red, Coral and Silver. 8 colours. 7/8 Sleeve. 2XS-4XL. Practical and not expensive. No ironing. Drapes beautifully and holds its shape. Green, White, Black, Blue. Sizes 6 to 26. From the Harvest Sportswear Collection. Comfortable 90% Cotton, 10% Lycra. Coordinates with Cotton Shirts and Polos. For a comfortable fitting and flexibility. 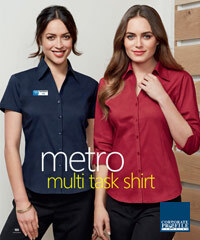 High quality shirts ideal for bars & pubs. Black, Navy, Sand, Mocha and Khaki. From $32.80 (20 pcs) ex GST. Wool Stretch Pants, Skirts and Jackets. wear for uniforms. Navy, Black, Charcoal. Grey. Solid Colours and Pinstripes. Ready to wear' stock service products. For all the details call Shelley on 1800 654 990. Crisp Cotton Oxford Shirt in long sleeves. Mens also available. Blue, Charcoal and White. Great for Pubs, Clubs, Cafe and Bars. Roll up sleeves with button tab. Chocolate. Long and Short Sleeve. work environment. 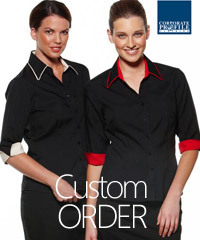 Quality Uniform packages. Cool, Breathable and Quick Dry fabric. Our Price From $52.80 each (20 pcs) ex GST. Matt jersey with a soft draped neckline. 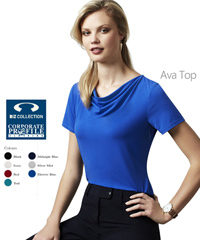 Cascade #2285 Ladies Ideal Top. Hospitality, Office, Beauty, Admin, Heathcare. neckline. Black, Red, Silver, Cobalt, Aqua. Keeps you cool, dry and comfortable. Lightweight. Wrinkle Free. PINTUCK on front. Black, Red, Blue, Grape, Cobalt, Navy, Teal. From $46.80 each (12 pcs) ex GST. and colours. Breathable and flexible fabrics. TEAL, RED, BLUE, AVOCADO, WHITE. Large size ranges from 6 to 26. $48.80 (12 pcs) ex GST. From $44.80 each (20 pcs) ex GST. Poppy is a fun and fashionable spot design. minimal or no ironing required. Black, Red, Grape, Cobalt, Navy, Teal. From $49.80 each (20 pcs) ex GST. Short Sleeve and 3/4 Sleeve. From $39.80 each (12 pcs) ex GST. self stripe, Marvel Button and V Cuff finish. Womens- Short Sleeve and 3/4 Sleeve. From $34.80 (30 pcs) ex GST. (Navy). Ladies Fitted and Semi Fitted. Sizes, 6-28. Short Sleeve & 3/4 Sleeve. The shirt fabric provides long lasting wear. hotels and hospitality, retail, pharmacy etc. 8 colours. Ladies Size 6-26 and Mens S-5XL. Also available with Stripes at same low price. longer body. Double Back Dart. Available in Sizes 6-28. White, Blue, Silver. collection of coordinated shirts and accessories. Your design and colours, various styles. Hard to find Sand Colour. Also in Black. Tabs on side of the Sleeve and Shoulders. From $28.80 (20 pcs) ex GST. (Dark Navy), Black, Stone. White. Modern fit, 100% cotton shirts. High performance, durability and comfort. Indigo Blue, and Vintage Blue. Pearl buttons. Single button on chest pocket. From $36.80 (20 pcs) ex GST. two Pant styles and two Skirt styles. 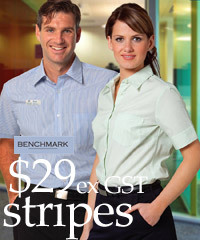 Ideal for high usage workplace Uniforms. two Pants and two Skirts. Sold separately. Banking, Casino, Hospitality, Government, Councils. giver to patient via their workplace apparel. Short Sleeve Knit Tops. Six colours. dobby shirting. Mens is excutive fit dobby shirt. Coordinates with Mia Top and Madison blouse. for a perfect fit and maximum comfort. Makes uniforms easier to manage with size fittings. 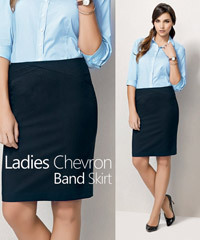 Womens has slightly lower waist fit with flat front. From $24.80 (12 pcs) ex GST. Club Cardigan. Sporty button front cardigan. High quality fine guage low pill Merino yarn. 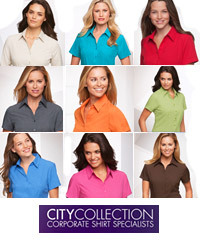 Perfect for club and corporate uniforms. workplace apparel in the Healthcare Industry. worn in a bow or left untied to drape effortlessly. Ladies 3/4 Sleeve and Long Sleeve. Lovely shirting fabric, always looks fresh. From $39.80 (20 pcs) ex GST. 80% Cotton comfort. Suits younger market. Black, White, Mid Blue, Dark Blue, Khaki. New Fabric Technology. Fully Lined. Impressive Slate and Denim Blue shirts. Solid Colour or Houndstooth Pattern. on the sleeve. Concealed button design. Efficient, versatile, with distinctive stripes. with mechanical stretch. Ladies and Mens. Vibrant colours. Red, Royal and Black. Sporty Heather Fabric with Spandex. Soft, and comfortable. Zippered side pockets. Jade Heather and Navy Heather. Sporty for Exercise, Health and Fitness. Colour is Carbon Heather with Black Contrast. and convertible hand warmer cuffs. Chin saver.